I have made changes so if you want the original recipe check the link above. 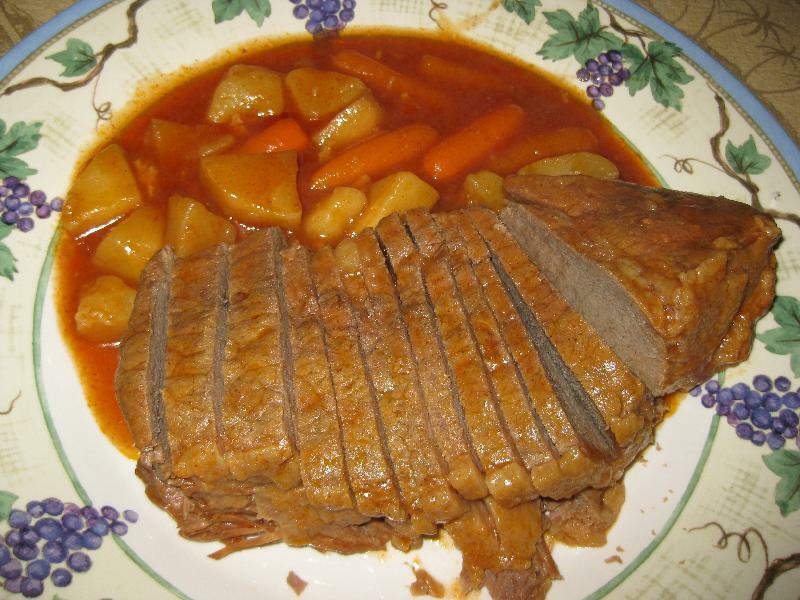 Use a large skillet coated with cooking spray to brown the roast on all sides. Drain. Transfer the roast to a crock pot. Put the carrots and potatoes on top of the roast. In a small bowl, combine the juice, tomato sauce, onion powder, vinegar, ground ginger, salt, and cinnamon. Pour this mixture over the meat and veggies in the crock pot. In a small bowl mix together the cornstarch and water until it is smooth. Pour this into the crock pot when there is an hour left for the roast to cook. Mix well into the juices.